All kinds of creatures were born in the intersection of the earth and ocean. The generosity of nature holds the bigness and pureness of life, which makes artists keep on searching for the origin of the truth. The world as a whole is connected by its own logic, and we share information, experience and evolution. The diversity of Eastern and Western cultures are like the two poles of a dialectical unity, they meant to be together. With the aim of introducing Chinese contemporary arts, Art Calorie is pleased to present Cicadas & Swamps: Metaphors and Records, a joint exhibition of two contemporary Chinese artists Zou Qionghui amd Chen Minghui, on view at Gallery 50 on Thursday, August 4, 2016 and run through August 11. The opening reception takes place from 17:00-21:00 on Thursday, August 4, 2016. The exhibit is free and open to the public. Zou Qionghui is an associate professor and master supervisor of Chengdu Academy of Fine Arts under Sichuan Academy of Music. In her early years, she graduated from Sichuan Academy of Fine Arts with excellent academic performance, and then engaged in advanced studies in Beijing Film Academy and Central Academy of Fine Arts. She kept creating and thinking in her studies, and formed her own art style and painting pattern during that period of time. As a member of Toronto Artists Association, Chen Minghui graduated from Harbin Normal University with Education of Art, and then entered into OCAD University and New York Studio School for furthur studies in the filed of oil painting, drawing, painting & sculpture. His artworks are reflections of his lifespan, which express his understanding towards the philosophy of life. During the process of arts making, he focused more on his memories, rather than what people would see in a real world. The exhibition features artworks from Zou and Chen who express their reflection on the relationship between human, society, and nature. Zou interprets life through Cicadas’ life span; in her paintings, cicadas become her coded language, metaphors for human’s spiritual loss in the materialistic society. Can human escape the emptiness of life and reborn like cicadas? Chen examines the destruction of nature caused by modern society; he preserves his childhood memory of swamps into record-style paintings. Through scanning the dimensions of space and the pot of time, he choses the simplicity of black and white to express his understanding towards nature, and how people could interact with nature harmoniously. 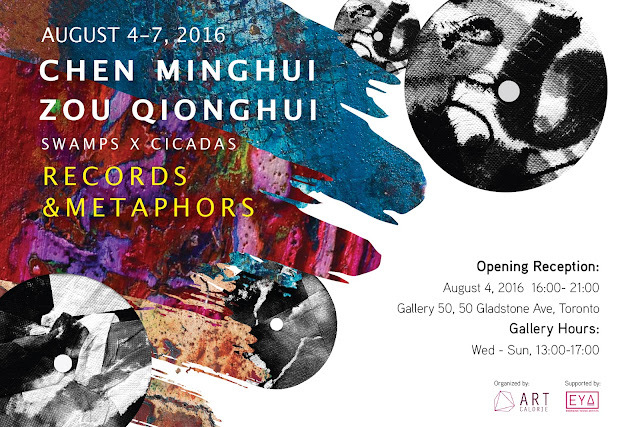 Cicadas & Swamps: Metaphors and Records showcases the unique artistic styles of the two artists, resonates with the viewers, and stimulates thinking. In this contemporary age, both of the artists want to offer the world some unique feelings from heart, instead of repeating the way of existing thoughts and practices. Please join us for our opening reception on Thursday, August 4, 2016, from17:00-21:00, at Gallery 50.